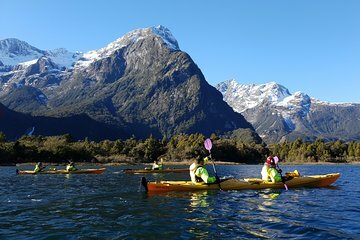 Kayak through the striking scenery of Milford Sound on this half-day paddling tour from Deepwater Basin. With a guide leading the way, you can focus on paddling and taking in the scenery on the journey. Paddle a big loop around the area, about 6 miles (10 kilometers), suitable for those of reasonable physical fitness. Learn about the area's environment and ecosystem through your guide's commentary as you travel. We kit you out with all the specialist paddling gear you need, including a buoyancy aid, spray skirt, spray jacket, thermals, a fleece, poggies (like gloves but better), a dry bag for your camera... and, of course, a quality sea kayak with a foot-operated rudder! Routes, durations and distances are approximate and depend on weather conditions on the day. Trip departure times may vary from those displayed.